OK it's been about 5 years and I figure, kinda like Jimmy Chitwood in Hoosiers, that it's about time I start blogging again. This space was reserved mostly for commentary about the state of Maryland basketball, but seeing as how it's baseball season, let's just dive into some Orioles talk, shall we? Then if I can get some writing momentum going, I'll check in with you on the Terps for the 2017-18 season, when the Melo-less Turtles try to find a new identity and reclaim a regular spot in the top 25. The view from our family seats in 328. As for the Orioles, I am hopeful for a winning and entertaining season. In the Buck Showalter era, at least we have a competitive team that has been near or at the top of the AL East standings the last five years. And that's saying something for a team and fan base that endured 14 consecutive losing seasons (1998-2011). Fourteen years of losing! After that many years, anything resembling a decent team should bring tears of joy to our collective, Orioles-loving eyes. But such is the human condition that as soon as you experience a bit of a good thing, you want MORE. Getting to the playoffs 3 of the past 5 years has been fun, but most fans now want the Os to take the next step and make a World Series run. Me? Of course a World Series would be nice, I mean it's been since 1983, which is, wait a sec... 34 years ago... but I also like to enjoy the ride. I have a 13-game ticket plan and what I really want, when I take my family of 4 to a ballgame, is to watch a team playing games that matter. When your team is 15 games out by the All Star break, it's not a ton of fun to sit around watching and hoping that maybe they'll go on a 27-game winning streak and get back into contention. And so I am truly thankful for the seasons we've had the last five years. They've been exciting and suspenseful and thrilling. Yes, also crushing and disappointing, but that's life, right? Allow me to end this post with a quick parenting failure story. The other day my son Alec, who is 9 and an improving young baseball player, said to me, "Dad, what do you think the chances are that I can make the Major Leagues?" I should say at this moment that we are jokesters but also realists in our house. Alec is funny and sharp; he gets sarcasm, has a YouTube channel devoted mostly to Trump parody videos, and watches more Simpsons episodes than he should. All of this is to say that I thought he could handle (and was aware of) the truth. So I said something like, "Oh, I don't know, about 1 in 5 million... you know it's not happening, right?" Oh man, wrong answer. He curled into a ball and wept tears of disappointment. I almost cried too. What had I just done to my child? He's 9... I could let him have the dream a little while longer but NO, I had to go and drop realism on him like a Chris Davis moonshot to right. 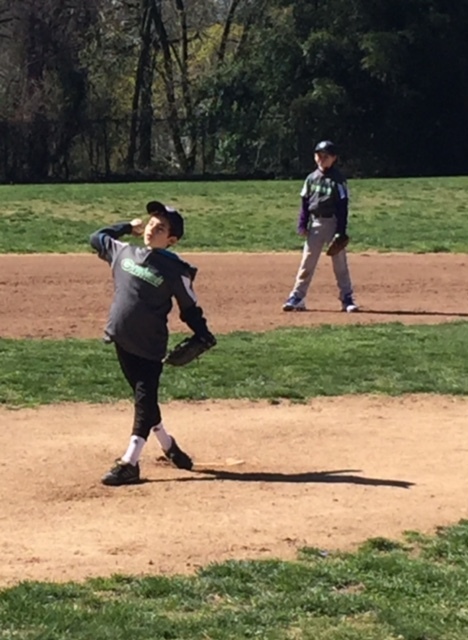 Here's Alec, 9, pitching in his first game. Well, after my feelings of guilt and his feelings of disappointment subsided, we went outside and had ourselves a catch. I went back to throwing him pop-ups and grounders and he went back to pretending he was in the Major Leagues. And that's the thing about baseball, you can always sit around and hope... for the next season, the next game, the next play, the next hit, the next out. But it's better to just live in the moment and hope to see a good game and if all else fails, just go outside and play catch. Welcome back my friends, I'll be back soon.